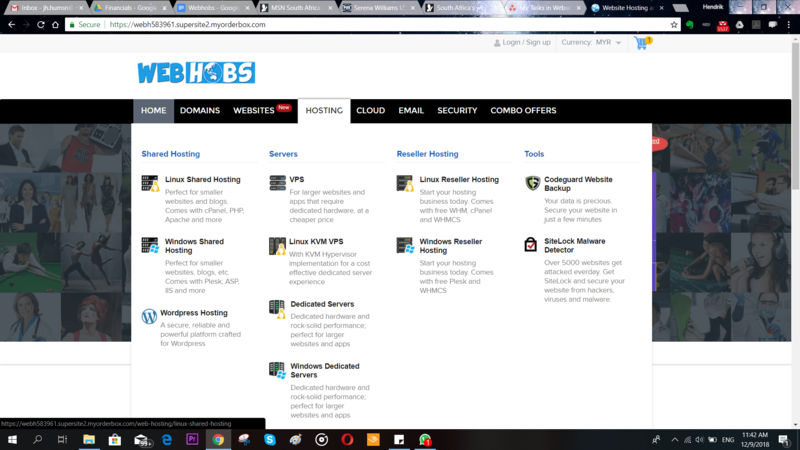 Webhobs Review 2019: Is Webhobs a Good Hosting? With data centers located in the U.S. as well as India, Webhobs provides the ability to have shared, VPS, cloud, or reseller hosting with a global reach. Webhobs was founded in January 2015 with the goal of providing a range of hosting solutions for different budgets and with a global reach. As such, they have data centers strategically located in both India and in the U.S. (Texas). In line with their global outlook, they provide currency support for AUD, CAD, CNY, EUR, GBP, INR, RUB, TRY, USD, and MYR. Unfortunately, they don’t offer any SSL certificates. Website Builders: You can use either the Weebly or Impress.ly website builders to create your website. These are very easy to use and fantastic web building tools. Security: Webhobs takes security very seriously and either provide security services with their VPS (especially the managed) plans or give clients the choice to include a Security Suite in their packages for shared hosting. Instant Scaling: A great feature for growing businesses is to add more resources at the click of a button so that you don’t run into uptime or load problems while your website is live. The range of products available at Webhobs means that the ease of use of using their platform is variable. With their WordPress hosting, you will have the content management system pre-installed and you can just start building and managing your site with it. With a VPS solution, you will need to be a bit more hands-on, unless you go for a managed option. Signup is also very simple with almost no upsells and a quick account creation but it can be a bit confusing when transferring or buying a domain. Linux: Four plans that vary in the number of domains (single to unlimited), storage (1 GB to unlimited), data transfer (10 GB to unlimited), and email accounts (25 to unlimited). Windows: Currently not available anymore, but should return in time. WordPress: Four plans that vary in WordPress installations (single to 5), CPU cores (dual to hexacore), storage (5 GB to 40 GB), and RAM (2 GB to 6 GB). Linux KVM VPS: Four plans that vary in CPU cores (2 to 4), RAM (2 GB to 8 GB), storage (20 GB to 120 GB), bandwidth (1 TB to 2 TB), and up to 1 additional IP. Dedicated: Windows and Linux each have four plans that vary in the model of Intel CPU, RAM (4 GB to 28 GB), and bandwidth (1 TB to 15 TB). All plans come with 1 TB of storage (2 TB max for Windows) and 2 free IPs. Managed server: Very similar to the above, but with 24/7 server management. There are reseller hosting plans for agencies although these have a few restricted countries. They also provide cloud hosting packages. Webhobs provide technical, billing, or sales support through dedicated email addresses or phone lines. Unfortunately, there is no live chat support. Although the technical support staff’s English is not always perfect, they are more than helpful and friendly throughout all interactions. You can wait a few minutes to get through though. Webhobs offers everything from shared hosting plans that cost just a few dollars a month to the high-end dedicated server hosting that cost hundreds of dollars so anyone should find something for their needs and budget. Although their support could improve slightly, the prospect of serving your websites with a global reach is a big draw. Wondering how Webhobs stacks up against other Web Hosting companies? Enter any other Web Hosting company and we will give you a side-by-side comparison.